Cureline offers to the biopharmaceutical and diagnostics companies collection, preservation and processing of clinically-defined and consented human tissues for research. 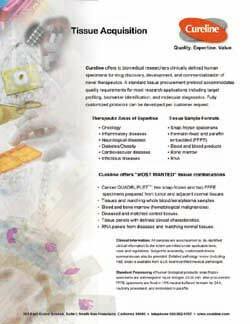 We have standard and custom tissue procurement protocols available for your research programs. Cureline collaborates with major clinical and research centers in Europe, Asia, and the USA on human specimen acquisition projects. Our team develops standard and custom tissue procurement protocols that are approved by local IRB and Ethical Committees and that comply with international and local regulations and guidelines. Cureline is committed to ensuring that the collection of human specimens for research purposes does not interfere with the patient's well-being and that a proper consent form is developed for each study in collaboration with clinical sites and the study sponsor. Standard Operating Procedures (SOPs) are implemented to guard patient’s rights and to use the human specimens with maximum efficiency. Custom Protocols Cureline offers to the biopharmaceutical and diagnostics companies collection, preservation and processing of clinically-defined and consented human tissues for research. Fresh Human Tissues and Blood Cureline provides high-quality human specimens for biomedical research. Fresh human tissues and blood are available for our USA-based customers. Samples from healthy donors and clinically-defined patients are available in 24 - 48 hours after collection. Matching Tumor Tissue Sets Cureline is a leading provider of primary tumor and matching recurrent or metastatic paired FFPE tumor samples. Such specimens are crucial for discovery of novel biomarkers of tumor progression and drug resistance. Human Therapeutic Plasma Cureline provides human therapeutic plasma for diagnostics development and validation.